The Thalmor is the combined government of the third Aldmeri Dominion and according to Ondolemar represents an alliance between Altmer and Bosmer regents. A militarist regime founded on beliefs of racial supremacy, the Thalmor seek to advance their power and influence across Tamriel with the specific intent of establishing the racial superiority of Mer over Man, "one century at a time". 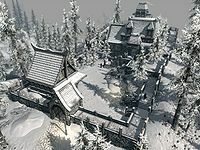 In Skyrim, they maintain an embassy in the mountains overlooking Solitude, are in control of Northwatch Keep (used as a covert detainment center for their political prisoners), and have an unused building set aside for them by the Empire within Solitude's city walls. Thalmor Justiciars can be found traveling the roads, sometimes with a Nord prisoner in tow, and engaging any Stormcloaks they see in combat. While not immediately hostile to you, conversing with them will reveal their antagonistic nature and choosing certain dialogue options (particularly on the topic of Talos worship) can turn them hostile toward you. Thalmor death squads may also track you down in the wilds, proclaiming "Behold the future! Behold the Thalmor!" as they attack. Prior to present-day Skyrim, the Aldmeri Dominion and the Empire waged a devastating conflict known as the Great War. The Dominion sacked the Imperial City and held it under military occupation for two years before the Empire was able to mount a counter-attack and reclaim the city proper. With the Empire greatly weakened after these campaigns, a peace treaty known as the White-Gold Concordat was negotiated. The White-Gold Concordat outlawed Talos worship, disbanded the Blades, and forced the Empire to cede much of southern Hammerfell to the Aldmeri Dominion. The Thalmor thereafter set up various embassies across the Imperial provinces, such as the one in Skyrim, from which their Justiciars and other agents keep the local provincial governments under control and enforce the terms of the White-Gold Concordat. According to Ondolemar, the Thalmor were the "Victors of the Great War" and the only reason the Empire still exists is because they "allow it to exist". Ancano College of Winterhold Thalmor advisor to the Arch-Mage. AncarionDB Northshore Landing Leader of the Thalmor on Solstheim. Elenwen Thalmor Embassy First Emissary to Skyrim. Estormo Labyrinthian Thalmor agent, second to Ancano. Gissur Thalmor Embassy Undercover Thalmor agent sent to track you down. J'datharr Outside Windhelm Stables Thalmor assassin sent to kill Malborn. Agent Lorcalin Shrine of Talos at White River Gorge Thalmor agent sent to kill Talos worshippers. Northwatch Guard Northwatch Keep Guards the front gate from possible trespassers. Northwatch Interrogator Northwatch Keep Justiciar in charge of interrogations at Northwatch Keep. Ondolemar Understone Keep Commander of the Justiciars assigned to Markarth. Rulindil Thalmor Embassy Third Emissary to Skyrim. In charge of interrogations. Agent Sanyon Southwest of the Guardian Stones (map) Dead Thalmor agent near a Talos shrine. Shavari Riften Thalmor assassin sent to kill you. Tsavani Thalmor Embassy Thalmor Embassy's cook. Captain Valmir Forelhost An undercover Thalmor agent. Thalmor come in three different types, with names based on their location. The type you encounter does not depend on your level, the only differences being in their armor, weapons, health, and magic. The boss in any encounters will always be a Wizard. 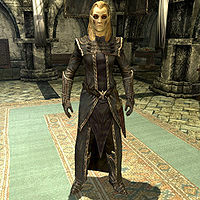 Though the lore states that the Thalmor are a union between Altmer and Bosmer, all Thalmor NPCs seen in Skyrim are Altmer. Justiciars are the official enforcers of the terms of the White-Gold Concordat, specifically enforcing the ban on the worship of Talos. They can be randomly encountered wandering the countryside accompanied by Thalmor Warriors. You have the option of talking to them and discussing various topics. Telling them that you worship Talos, support freedom of religious belief, or lingering too long near one will provoke them into attacking you. They can either be Warriors or Wizards, and will be equipped as such. Thalmor Archers use elven or glass bows and arrows and wear light elven or glass armor depending on your level. They carry a leveled dagger (steel, elven, or glass) and a random selection of gems, food, drink, and gold. 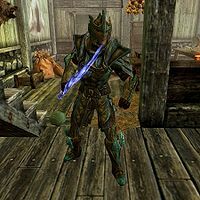 Thalmor Warriors use leveled one-handed weapons, made of steel, elven, or glass, and wear leveled armor, made of either elven or glass, depending on your level. They can hold just a weapon, a weapon and shield, or dual-wield two weapons. They carry a leveled dagger (steel, elven, or glass) and a random selection of gems, food, drink, and gold. 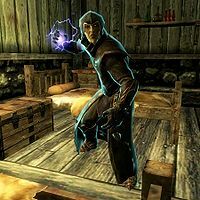 Thalmor Wizards are the main spell-casters of the Thalmor armies, and are generally harder to kill, even though they only wear robes. They carry a leveled dagger (steel, elven, or glass) and a random selection of gems, soul gems, ingredients, potions, and gold. 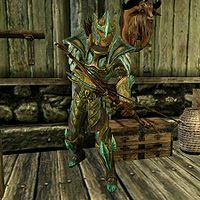 All generic Thalmor have weapons that are leveled, and can be either steel, elven, or glass; the only exceptions are the archers' bows, as there are no steel bows. The archer and warrior classes wear leveled armor, either elven, gilded elven or glass; the only exceptions are the warrior's shields which are either elven or glass and are leveled separately. A New Source of StalhrimDB: Find a blacksmith missing from Skaal Village. 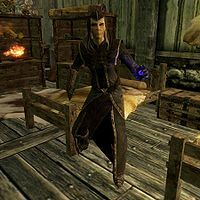 Justiciar: "I am a Thalmor Justiciar on important business that you are interfering with." Player: "Who are the Thalmor?" Justiciar: "We are special envoys of the Aldmeri Dominion, the rightful rulers of Tamriel. If you'd like I can show you why." Player: "What are you doing in Skyrim?" Justiciar: "We're making sure your Emperor wasn't lying to his elven masters when he agreed the Empire would give up false gods and foolish beliefs. Perhaps there's something you wish to confess?" Player: "Do all Thalmor have such high opinions of themselves?" Justiciar: "That we are superior to men is an established fact. For example, take this belief in Talos. The "ninth" Divine. Heh. Certainly you don't believe such things? Perhaps there's something you wish to confess?" Player: "What's wrong with worshipping Talos?" Justiciar: "It's immoral to worship a man. And it's also illegal. A faithful Imperial citizen would know that. Perhaps there's something you wish to confess?" Player: "You got me. I believe in Talos." Player: "I can worship anyone I want." Justiciar: "I don't like you... I think you're a heretic." "You're interfering with official Thalmor business." "This doesn't concern you, "citizen."" "And now you'll walk away, if you know what's good for you." "If you're smart, you'll walk away." "Perhaps there's something you wish to confess?" "Now, get of my way." "Go now. Return to your pathetic pursuits." "Be warned. You have been marked by the Thalmor." "Now remove yourself from my presence, while you still draw breath." Elenwen is present at the execution in Helgen when Alduin attacks during the first main quest, Unbound. According to dialogue from Delphine and Legate Fasendil, the Thalmor even carry out acts of ethnic cleansing on some segments of their own Bosmer and Altmer populations, which are never heard about elsewhere in Tamriel. The reasons for this are unclear, but Fasendil's comments suggest this is related to the quelling of dissident uprisings. J'datharr's Note — Mark information for a Thalmor Assassin. Thalmor Dossier: Ulfric Stormcloak — Thalmor Dossier on the Stormcloaks leader and Jarl of Windhelm Ulfric Stormcloak. Thalmor Orders by Elenwen — A communique from a Thalmor agent to a subordinate scout. Valmir's Orders — Orders to retrieve Rahgot's Dragon Priest Mask. This page was last modified on 23 March 2019, at 20:49.